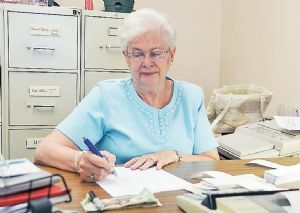 GRANTSVILLE — Gloria Martin, town clerk and treasurer of Grantsville, is retiring after seeing eight mayors enter office, a myriad of changes and 44 years of service to the town. Mayor Paul Edwards said Martin is “very knowledgeable on the town,” helped to mentor him and was instrumental in getting him to the place he is today. Martin said she thought about retiring before but just never followed through with it. Martin saw eight mayors come and go in office and one of her saddest memories was when Mayor Donald Swauger died in 1974. Martin saw the town grow and change during her tenure. She mentioned a new industrial park and quite a bit of annexation. Martin’s duties as treasurer and clerk included taking care of all the accounts, water bills, taxes, prior to the county taking them over and writing grant requests. From 1969 to 1991, Martin performed all those duties at her house. “I could stay home and raise my children and do my job at my own leisure,” said Martin. Once a new office was built and computers came into the picture, Martin had to go into the office but she has always preferred doing accounting the old-fashioned way. Martin doesn’t use a computer at home but suspects at some point she’ll have to give in and use one to pay her bills. When Martin was younger, she used to watch her mom, who was a bookkeeper for the Casselman River Railroad, working and ask her questions about what she was doing. Martin graduated from Northern High School where she took accounting, went on to attend Frederick Community College for a year and then worked at a bank in Frederick for four years. Robin Jones, town administrator, will take over Martin’s duties. Upon retirement, Martin plans on completing all the little projects she has been putting off, spending time with her husband, Bill, and her grandkids. Martin also plans on spending more time indulging in her passion for reading and sharing her library of more than 100 Christian books. She also plays the organ at both State Line United Methodist Church and St. Paul’s Methodist Church every Sunday. Martin, who started working for the town in May 1969, retired on Monday.